Togetic escreveu: I'm playing the newest version and i'm confused on how i'm supposed to mega evolve? 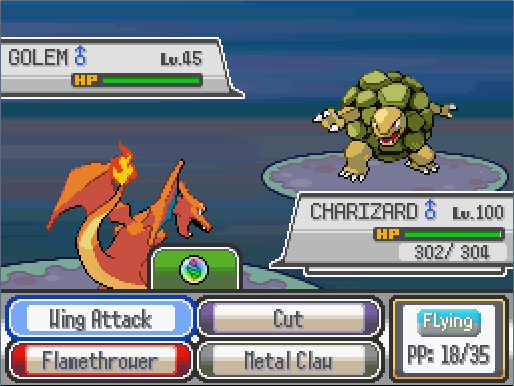 I'm in Hoenn now and only just gotten a pokemon that can use one of the mega stones i've been given, getting a charizardite X and a blastoisinite, but neither pokemon can mega evolve when they're holding their stone from what I can see. There's no button to do it like i've seen in other essentials fangames and it's not triggered on defeating one of an enemy's pokemon like Greninja's form change. 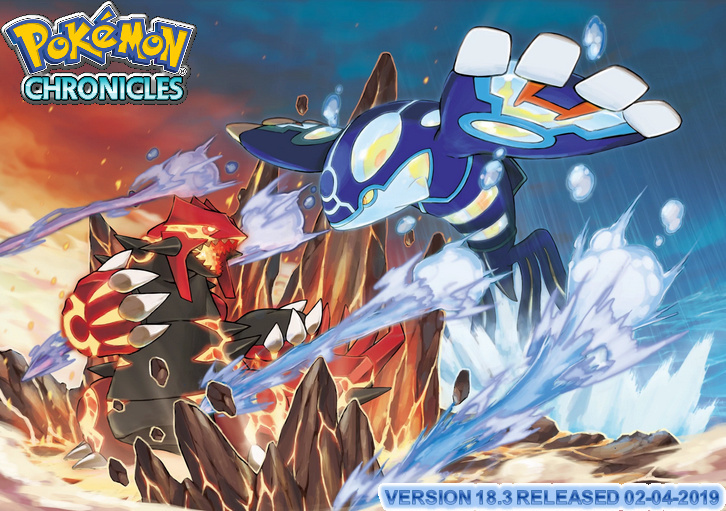 1- You must have mega ring and mega stone. 2- Make your pokemon holding the corresponding mega stone. 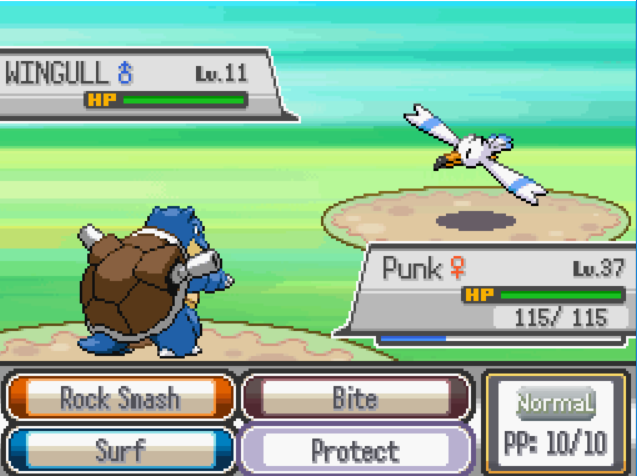 3- When in battle, an icon appears, above the moves selector. Indicating if the mega form is triggered or not. 4- Press the select button or talk button, i don't remember well now, and then the battle move. Then it will automatically change form. 5- You can only have 1 mega pokemon per battle. I think. I think that now giovanni's mewtwo can change into one of the mega forms. I've tested it before. Ricardo PT escreveu: I think that now giovanni's mewtwo can change into one of the mega forms. I've tested it before. Hmm... That's odd. In the older updates, i've tested the mega evos and giovanni's mega mewtwo and they worked fine. 1st- I detected a little error about the ribbons change. You can evolve into mega forms. There's nothing wrong about it. In the image, the pokemon is about to change its form. As you can see i pressed the Z button and it turned green. When in mega form that button disappears. 3rd- Giovanni's mewtwo use the mega stone but, it don't change it's graphic. PE v17.2 editor brought some issues about wild and trainer forms. The birthsigns scripts already fix the wild forms, like: unowns or vivillon forms. I will talk about this to my scripter to see if he can fix the issue. Another thing, the "fakegroundon" also used to be different in terms of graphics. But it don't changed too. I will fix this later, because, it requires some expertise in programming, and i can't do it alone. This system was not created by me. 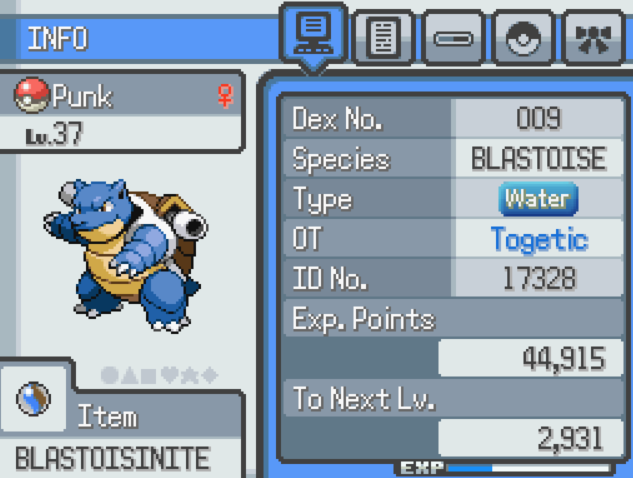 The first screenshot is the status screen of my blastoise during the battle, and the second is my blastoise in the battle being unable to mega evolve, the icon just isn't present for whatever reason. It's the same for my charizard. For some reason, i can't see your images. To mega evolve, you only need to have the mega ring, or bracelet with you, which is key items, plus mega stones. The mega stones events don't unlock megas or anything else, they only gives the players the tools that are required to mega evolve. If your, for ex: charizard is holding the right mega stone and if in your key items pocket you have one of those items above, you should be able to mega evolve. There isn't any problems with that system, i can mega evolve freely, and only you reported this issue. Recently, i was fixing a saved game from a player about the dex error from my v18.2. And i tested mega evos in his save game to see if they work, and they worked fine. That system was been developed by the PE team, and i only scripted the mega evos in my project. I released this mega stuff a few updates ago, maybe before 2017, and using pokemon essentials editor v15, which i now have its last update v17.2. When i released the v18 massive update, my projects took a big jump from PE v15 to PE v17.2, lots of things were fixed, improved or changed, that's why sometimes players can have a little issue here and there until i fix all the important stuff first. But, i fixed all those things for now, even little fixes that you mentioned before. So, the only thing that i can suggest you, is to send me your save game file. So i can test it and see what's causing you the trouble. If you don't know where is your save game, check the WORD file about game installation at the bottom. Attach it to an email and send it to me by using the game's email that i always post in the updates threads. Sorry, I messed up the image insertion and didn't directly link to the image file so it broke. I've sent you my save so you can take a look, it's a weird problem and especially so if i'm the only one to have it so far. Togetic escreveu: Sorry, I messed up the image insertion and didn't directly link to the image file so it broke. I've sent you my save so you can take a look, it's a weird problem and especially so if i'm the only one to have it so far. Now i can see the images. Ok, i will check your save file as soon as i can. I always trying to make the things right in the game. I fixed lots of issues that were reported by you and a few players. Yesterday, i post a thread in another forum, relic castle, about mewtwo mega form and groudon form for jirachi event only, when opponents are using them, they don't change its sprites, its a little issue but it don't make the game to crash. I always prioritize game crashes fixes or fatal errors, then the minor issues. Anyway, i will fix your save file with the dex fix too, so you can have the dex nº 808 and 809.